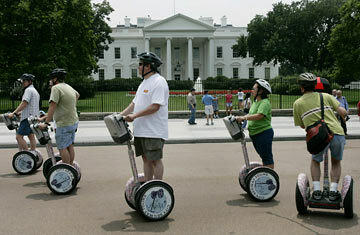 The Segway two-wheel personal transportation vehicle was launched in 2002. When the product was launched, the head of Segway said it "will be to the car what the car was to the horse and buggy". Famous venture capitalist John Doerr said that Segway sales might hit $1 billion as fast as any company in history. The company spent about $100 million developing the product. Segway did not understand that its price point, well above $3,000 for most models and $7,000 for some, was too high to draw a mass consumer base. The other major unforeseen problem is that the Segway was classified as a road vehicle in some countries requiring licensing, while it was illegal to use on roads in other nations. From 2001 to the end of 2007, the company only sold 30,000 units of its two-wheeled scooter.